Jeff Bridges finds the perfect vehicle for his lazy charm and bitter irony in the role of Bad Blake, a washed-up country star trying to climb out of the bottle and put his life back together. Once an incisive and lionized songwriter, Blake now drives around the southwest, wandering through his old hits at honky-tonk gigs. An unexpected romance with a newspaper reporter (Maggie Gyllenhaal) offers hope of personal redemption, and a contract writing songs for a stadium-packing country heartthrob (Colin Farrell) promises something of a comeback, but they don't call him Bad Blake for nothing. Robert Duvall, who played a similar character in Bruce Beresford's Tender Mercies (1983), turns up in a supporting role, and the movies make good companion pieces; Bridges can't match the emotional volatility Duvall brought to his ruined singer, but he invests Blake with a humor and intelligence that make him more self-aware in his decline. Scott Cooper directed this 2009 drama, which won Bridges an Oscar. Crazy Heart, Dear John, From Paris with Love and more. 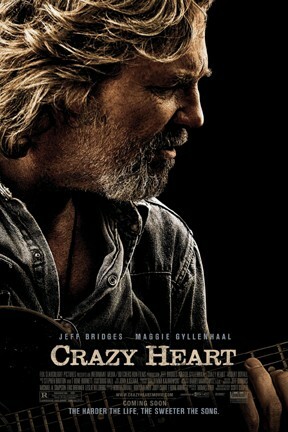 Crazy Heart is not showing in any theaters in the area.